Nine-year-old Sophina Lindquist of St. Cloud knows how to hit a target and how to put out a fire – at least an imaginary one. She did it recently on the back lot of the St. Stephen Fire Department. Standing there on the edge of the lot was a “fire house” constructed by Tim Haas of Sartell, who made the mock house as part of his requirements to become an Eagle Scout. The house front has two cutout windows in it. Within each cutout is a bright-red-orange flame logo that spins when it is hit by water from a fire hose. The structure is a fun way for children to learn about fire safety and firefighting. 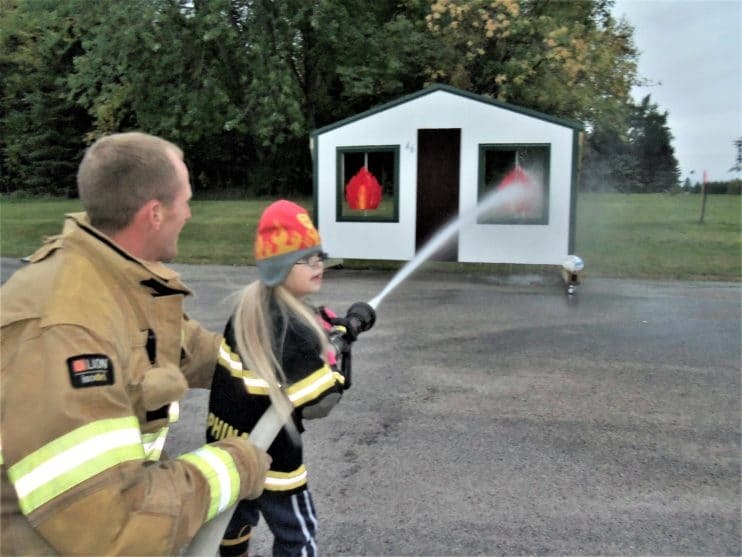 For its debut at the St. Stephen Fire Department, guest of honor Sophina was chosen to be the first to try her hand at “dousing the window flames.” She was invited by Cris Drais, the wife of the St. Stephen Fire Chief Jeff Drais. 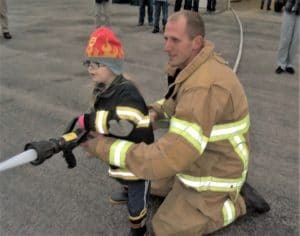 Sophina has long been a hit with St. Stephen firefighters, not to mention firefighters, police and other emergency personnel from a wide area. Dubbed the “Cookie Girl,” for about five years she has been bringing chocolate-chip cookies to the firefighters as a morale booster and a way to say thank you. She is also known as the Tiny Prayer Warrior because she regularly prays for more than 1,200 firefighters, police, deputies, highway patrol officers, first responders, medical-emergency workers and other emergency workers. She knows all of their names and prays for all of them. She has been saying prayers, plus delivering cookies, for the past five years. Her sister, Victoria, 19, usually accompanies her on her cookie deliveries, sometimes with her parents, Scott and Connie, and sometimes with sister Catherine, 18, who bakes the cookies – thousands upon thousands of them each year. On Oct. 1, Sophina (carrying a big box of cookies), mother Connie and sister Victoria arrived at the St. Stephen Fire Department. There, Cris Drais, several firefighters, Boy Scouts and others welcomed Sophina. The welcoming committee included Haas, who constructed the fire house. After munching on delicious cookies, those gathered walked out to the south side of the fire hall. Sophina was wearing her honorary firefighter’s suit, eager to douse the “flames.” Then, she and firefighter Brad Kostreba clutched the fire hose and aimed it as the water gushed out in a high-pressure stream. As the two firefighters adjusted the aim of the water stream, within a short time the stream slammed into one and then the other of the “window fire flames,” and they began to spin wildly. Everyone watching cheered. Fire doused. Good work. Mission accomplished. Haas said the fire house cost $500 to make and that the Sartell American Legion donated the funds for the wood, the paint and the other materials. He built it at summer’s end, and for a finishing touch, he painted the house number 46 on the structure because he is the 46th Scout in Sartell history to attain the prestigious title of Eagle Scout. With an expert aim, Sophina Lindquist and Brad Kostreba succeed in hitting a “flame” in a window of the “fire house,” causing the flame logo to spin wildly. Guest of Honor Sophina Lindquist of St. Cloud helps St. Stephen firefighter Brad Kostreba aim a water hose at a practice “fire house” built by Tim Haas of Sartell for his Eagle Scout project. 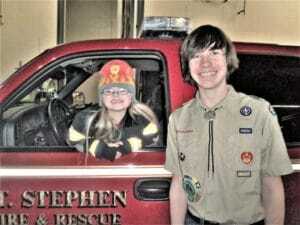 Eagle Scout Tim Haas and special guest Sophina Lindquist get their photo taken by a St. Stephen fire truck. Sophina is wearing her honorary firesuit. The St. Cloud girl is well known for bringing cookies to area fire departments – cookies baked by her sister, Catherine. Sophina is the daughter of Scott and Connie Lindquist.